Learn grading: What are full bell lines? Left: Reverse of 1952-S Franklin half dollar, graded MS-65. Right: Reverse of 1948 Franklin half dollar, graded MS-66 FBL. NGC’s designation gives collectors a more comprehensive assessment of Franklin half dollars. 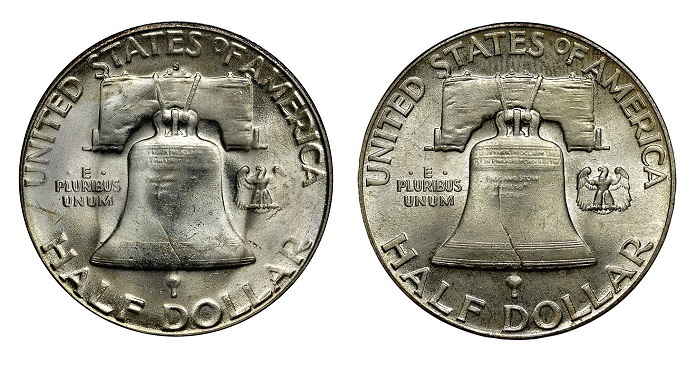 The Franklin half dollar series (1948-1963) is the shortest half dollar series after the Civil War. Relatively easy to collect, the series was cut short by the intense response to the assassination of President Kennedy, which resulted in a new half dollar series. The coin features the iconic Liberty Bell on its reverse. To qualify for NGC’s full bell lines (FBL) designation, all the horizontal lines on the bell must be distinct. Often, the strike can leave the lower bell lines incomplete. The rarity of the FBL designation varies across the series, though coins from San Francisco consistently have trouble qualifying. Franklin half dollars do not need to be Mint State to qualify for the FBL designation, but it should be no surprise that most that qualify are Mint State. The FBL designation is not used for Franklin half dollar Proofs, which are assumed to have been well-struck. 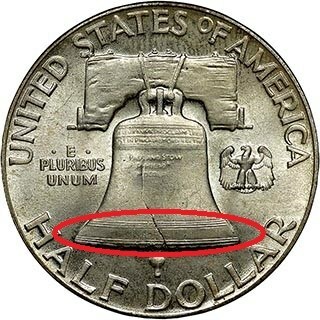 The part of the Franklin half dollar that determines the FBL designation. The Franklin half dollar is the only half dollar with a unique strike character. Other series with unique strike characters include the Standing Liberty quarter, the Mercury and Roosevelt dimes, and the Jefferson nickel. Coins with certain strike characters are often more highly prized by collectors. As a result, strike characters are separated on different lines for each coin in the NGC Census to give a better understanding of their relative rarity. The NGC Price Guide also lists the FBL designations separately. NGC assigns these strike characters automatically as part of its normal grading process for no additional fee.